Week 9 is in the books and the race is wide open. No team is undefeated in league play and five of the league’s seven teams have only a single blemish on their conference ledgers. The unpredictability of conference play was again on full display this past Saturday. Duquesne and Sacred Heart were both riding high into Week 9 road matchups with their Jerry Rice Award candidates under center, but both teams fell back to the pack in the race for the NEC title and the coveted FCS playoff bid that comes along with it. Bryant (2-1) held the Dukes (2-1) without a touchdown pass for the first game this season and intercepted quarterback Dillon Buechel three times. Still, Duquesne out-gained Bryant and recorded nine more first downs than the Bulldogs, but could not overcome a minus-4 showing in turnover margin. Winning on the road in league play isn’t easy as Sacred Heart found out during its visit to Saint Francis. The Pioneers, who are now 2-2 in league play, lost for the third time in their last three trips to DeGol Field. Meanwhile, Saint Francis, which held SHU’s RJ Noel to only 94 yards passing and one touchdown, finally translated potential and ability into a NEC victory. The Red Flash, who are 1-1 in league play after splitting their games against the NEC’s Nutmeg State contingent, will play their next two games on the road. After hosting one half of the Steel City contingent in Smithfield during Week 9, Bryant will head out to Pittsburgh to face Robert Morris in Week 10. The Colonials evened their league record at 1-1 with a Week 9 victory at NEC preseason favorite Wagner (1-3). Central Connecticut was off from NEC play last Saturday, but the 1-1 Blue Devils are in the mix as well. With two teams having a chance to move to 3-1 in NEC play this weekend, the picture may be a bit clearer heading into Week 11. There is also the possibility of a three-way tie for first place after the Week 10 slate. The NEC standings may contain three 2-2 teams and another three teams at 2-1 come Sunday morning. While the race for the NEC title is heating up, the race for the NEC’s all-time receiving record is over. Bryant’s Jordan Harris, a Walter Payton Award candidate and a Preseason All-American, made six receptions for 91 yards in the 42-14 win over Duquesne. The performance pushed him past former Saint Francis great Michael Caputo and into first place on the conference’s all-time receiving yards list. Fans can watch Harris in action on November 2 when he leads Bryant into the #NECFB Game of the Week on ESPN3. The Bulldogs will open the stretch run at Robert Morris in a game that will kick off at 12:00 pm EST. “@NECFootball: A 90-yard touchdown run? That’s apparently what Kyle Harbridge just did for @SFU_Football.” We ❤️ Kyle! Robert Morris defensive coordinator Scott Farison celebrated his birthday on Thursday, and one of the top defensive players Farison has ever coached fired off this congratulatory tweet. Alex DiMichele, who won the 2010 NEC Defensive Player of the Year award while helping RMU to a conference championship, is now colleagues with Farison. DiMichele is currently a graduate assistant defensive line coach for Robert Morris, which visits Wagner on Saturday. It’s safe to say that this Red Flash fan is fired up for another season of swimming. Four-time defending NEC champion Saint Francis opens its home schedule on Saturday, October 26 with a dual meet against A-10 member Duquesne. It’s more than just the home opener, too. The Flash will celebrate its annual “Think Pink” event around the meet. All proceeds raised by the swim team will be donated to the Joyce Murtha Breast Care Center at the Windber Medical Center. Apparently, Tupper is more than just a cute face. Bryant’s bulldog mascot is also good with a camera. Thanks for this snapshot of Bryant’s picturesque campus. Hopefully the weather stays beautiful because there is a ton of NEC action scheduled in Smithfield this weekend, including a key women’s soccer contest on Friday afternoon and a marquee #NECFB matchup on Saturday. The NCAA bowling season has begun, and this rookie Blackbird is putting in work. When all 7 teams in your conference are ranked in the National Top 20, there is no time for slacking. What a couple of weeks it’s been for RJ Noel. After totaling 310 yards and five touchdowns in a NEC win over Central Connecticut on October 12, life has only gotten better for Sacred Heart’s rookie quarterback. Two days later, the 6-foot-1 signal caller won the Sports Network’s National FCS Freshman of the Week award for that performance. Then, on Thursday October 17, Noel received the honor of being the featured guest for the weekly #NECFB Google+ Hangout. The level-headed Noel responded to the increased attention by going out and producing another five touchdowns as Sacred Heart (7-1, 2-1) picked up another NEC win – a 56-28 road triumph over Bryant on October 19. The performance wasn’t enough to land Noel a second straight National Freshman of the Week honor, but it likely cemented the decision that was announced on October 22. Likely impressed by the fact that the redshirt freshman has throw a NEC-best 18 touchdown passes to only three interceptions, the Sports Network added Noel to the Jerry Rice Award Watch List. Noel joined 20 other rookies who are candidates for the honor, which is presented annually to the top first-year performance in Division I FCS. Noel’s addition doubled the NEC’s presence on the Jerry Rice Award Watch List, which also features Duquesne rookie quarterback Dillon Buechel. While Noel has the most victories (7) and touchdown passes of all NEC quarterbacks thus far this season, Buechel leads the league in passing with 1,550 yards through six games. On October 24, Duquesne receiver Gianni Carter, one of Buechel’s top targets, spoke about the rookie’s poise amongst other things during the latest weekly #NECFB Google+ Hangout. Both rookie signal callers will face tough road tests in NEC play during Week 9. Noel and the Pioneers must travel to Saint Francis, which enters off a bye. Buechel and the Dukes make their longest road trip of the conference season to face a Bryant team looking to bounce back from a Week 8 setback to Sacred Heart. There is a lot of football to play before then, but that November 9 between Duquesne and Sacred Heart (slated to air on ESPN3) is becoming more meaningful by the week. At the least, the game will showcase the NEC’s two talented rookie quarterbacks, who have each taken a turn at making national headlines. Duquesne and Sacred Heart both have winning records and have both been beneficiaries of productive play at the quarterback position. The Dukes, who are the lone remaining NEC unbeaten, moved to 2-0 in conference play by spoiling Homecoming Weekend at Steel City rival Robert Morris. One week after being named to the Jerry Rice Award Watch List, Duquesne QB Dillon Buechel threw for 202 yards and two touchdowns in the razor-thin win over RMU. He leads the NEC in passing yards (1,550) and completion percentage (62.3). Sacred Heart separated itself from Bryant with a 28-point fourth quarter. The Pioneers, who lead the nation in turnover margin (+19), came up with five takeaways and redshirt freshman QB RJ Noel was responsible for five touchdowns. Noel has been one of the reasons for SHU’s stellar turnover margin. The rookie has thrown a league-high 18 touchdown passes and has been intercepted only three times. There are still two more weeks of football to be played before the two rookie quarterbacks collide at Sacred Heart’s Campus Field. Duquesne’s next challenge comes on Saturday, October 26 in Smithfield. Making their longest NEC road trip on the schedule, the 2-0 Dukes will face a 1-1 Bryant team that will be looking to give its title hopes a boost after last week’s loss. Duquesne will attempt to do something that few NEC teams have been able to do in recent years – contain Bryant WR Jordan Harris. The Walter Payton Award candidate caught 10 passes for 163 yards and three touchdowns against a formidable Sacred Heart secondary in Week 8. With 3,403 career receiving yards, Harris enters the Week 9 matchup needing only 62 more yards to break the all-time NEC record. While Duquesne has its hands full with Harris, Sacred Heart takes a dangerous trip to Saint Francis. Despite the fact that the Pioneers carry a 7-1 (2-1 NEC) record into the game while Saint Francis sits at 2-4 (0-1 NEC), this one promises to be an ultra-competitive matchup. First, Sacred Heart will be playing on the road for a second straight week while Saint Francis comes off a bye. Next, one must consider that SFU’s DeGol Field has been a house of horror for Sacred Heart in its last two visits. SHU has lost both contests, being outscored by an 85-24 margin. Sacred Heart is a perfect 4-0 on the road (wins over Marist, Lafayette, Bucknell, Bryant), but that number won’t be enough to intimidate Saint Francis. The Red Flash went toe-to-toe with nationally-ranked Fordham and James Madison already this season, and were either tied or ahead at some point in the fourth quarter of both games. With their Week 8 triumphs now history, the top-two teams in the NEC standings and their rookie quarterbacks will face tough road tests in Week 9. Should they pass, that November 9 game will become even more meaningful. Great #SteelCityRivalry game tonight props to bobby mo. Huge win for The Dukes. Praying for that feller that got hurt tonight hope he’s ok. 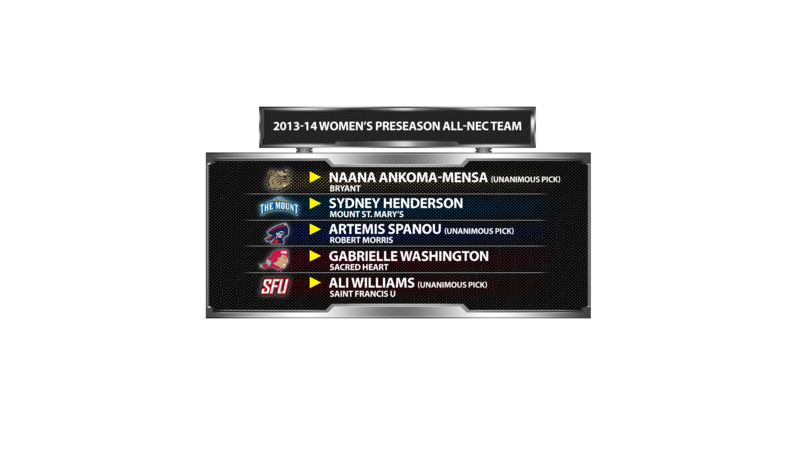 Moments ago, Dave Popkin and Tim Capstraw unveiled the results to the 2013-14 Northeast Conference women’s basketball preseason coaches’ poll along with the five-member preseason all-league team. We have listed the selections below. The men’s announcement will happen on Front Row at approximately 12:05 pm. Love the fact that @JamionChristian is only #NEC head coach not in Dark Suit. #MountMayhem stands out once again. I like what the players have to say at #NECinNYC. Talking about their favorite match ups, the respect they have for each other is great. 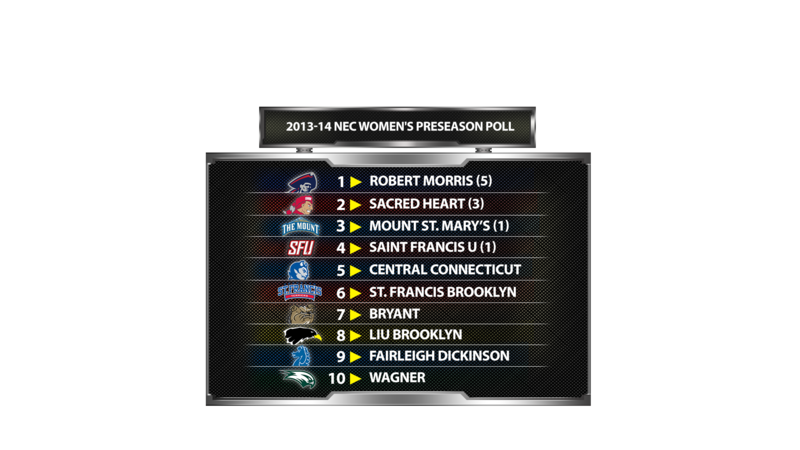 UPDATED (12:22 pm): Wagner headlined the 2013-14 #NECMBB Preseason Coaches’ Poll.